Heat oven to 400°F. In medium bowl, mix artichokes, mayonnaise and 2 cups of the cheese. Spread mixture in ungreased 13x9-inch (3-quart) glass baking dish. In small bowl, mix remaining 1/2 cup cheese and the bread crumbs; sprinkle over artichoke mixture. Bake 10 to 12 minutes or until thoroughly heated. Garnish with red bell pepper and parsley. Serve dip with melba toast rounds. This is an easy recipe to cut in half if your group is smaller. 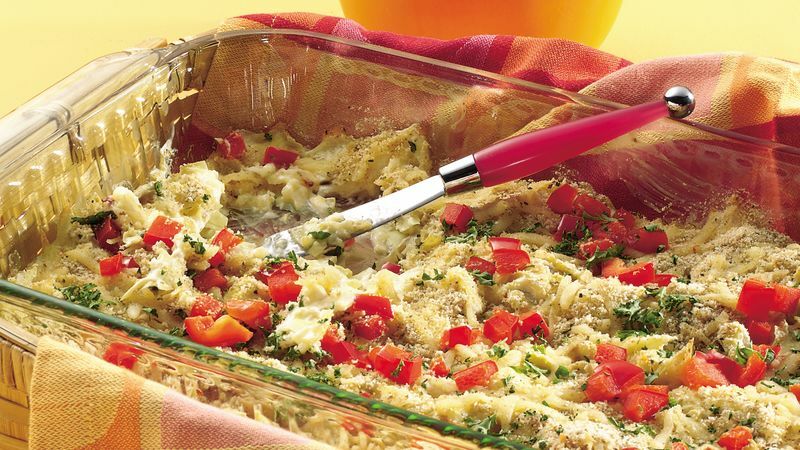 Bake in an 8-inch square baking dish.